Home / About / Made a purchase? Leave a review! Made a purchase? Leave a review! 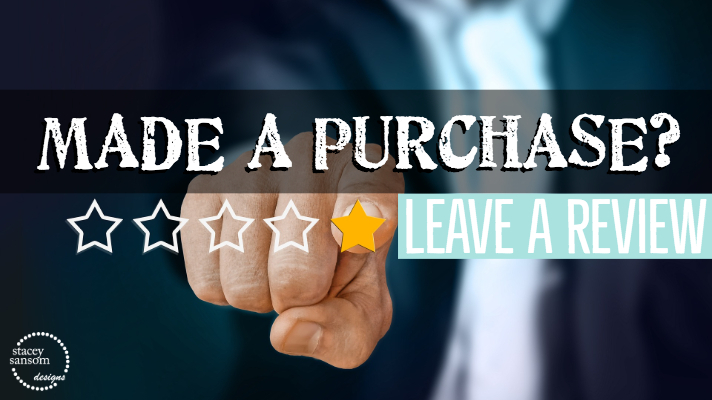 If you have made a purchase from Stacey Sansom Designs, please leave a review! It does not matter if it was a product or service, we want to hear about your experience. We like reviews. Good or bad, we want to hear about it. We can’t fix it if we don’t know there is something wrong. We may stop doing something that you enjoy if we don’t know it is important to our customers. So speak up and let us hear about it! Tell us what product or service you have used and what your experience was. Did our product meet your expectations? Can we do something a little differently next time? Was it easy to register for classes or make appointments?